SOLO Swiss, builder of controlled atmosphere furnaces since 1945, just launched a Profitherm 1000 heat treatment transfer line for the aeronautics and automotive industry in Asia. 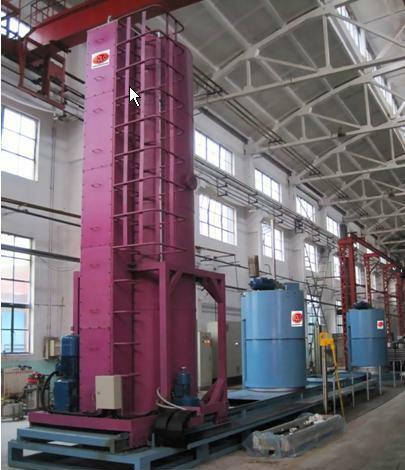 This SOLO Swiss line, designed to treat parts up to 3 meters long, such as 45CrNiMoVA transmission shafts, includes a load transfer bell, a vertical austenitizing, carburizing and carbonitriding pot furnace up to 950°C, a 120°C oil tank, a nitrogen-controlled tempering furnace, a tempering furnace under N2 atmosphere, a washing machine with oil separator, a loading, unloading and storage area, and an AXRON Swiss Technology control and oversight system. Treatment is carried out in a controlled atmosphere to avoid any superficial weathering on small-diameter parts. This installation can handle loads of up to 850 mm in diam eter and 3000 mm in height for a weight of 1000 kg in the aeronautics, aerospace, automotive and weapons industries. The operator prepares the load from station 2. As soon as the treatment recipe is launched, the load is retrieved at transfer station No. 1, which transports it on the first programmed station in the cycle, in this case, the quenching furnace in station 3. Once the load is placed in the furnace, the treatment cycle can then begin. 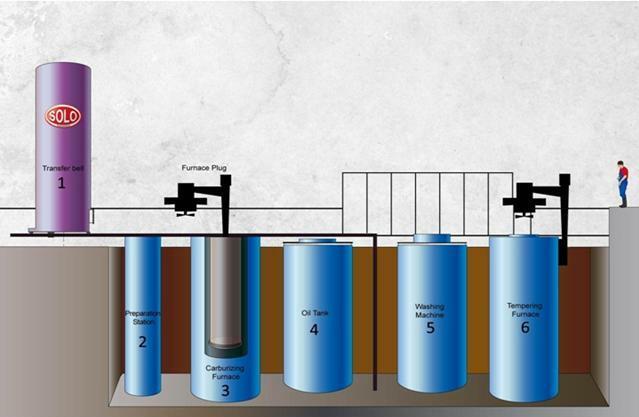 The transfer of the load from the furnace into the oil tank (station 4) takes place via the transfer station (belt). The load can thus travel shielded by gas. After positioning the belt on the oil tank, the transfer belt’s elevator takes the load to immerse it in the tank. The descent of the furnace into the tank takes place in less than ten seconds. Once quenching has occurred, the parts then pass into the washing machine (station 5), from which they are transferred in the tempering furnace according to the planned recipe. 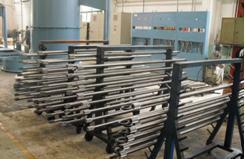 In the current case, the parts are treated with a carbon potential controlled by an oxygen weld and a CO/CO2 analyzer. 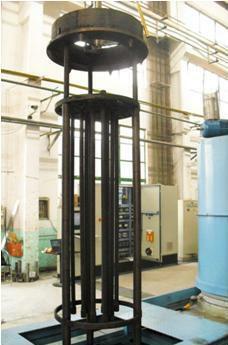 The atmosphere is obtained in the quenching furnace by direct cracking of methanol. – three separately adjustable nitrogen flows (safety, venting and cycle). It is thus possible to move from a methanol atmosphere to a methanol/nitrogen atmosphere in just moments, which allow you to work just as well with 32% CO (to enable high transfer coefficients to work) as with lower CO% (to limit intergranular oxidation and also diminish the %H2 of the carburizing atmosphere). The recipe can be composed of as many steps as necessary. In each step all the parameters cited above are definable: temperature, speed of rise in temperature, holding period, turbine speed, choice of carrier gas, choice of additional gas (NH3), value of CO, regulation of carbon potential, choice for means of measuring carbon potential (weld or analyzer), regulation of carbon potential without air or without propane, etc. The treatment recipe becomes a true metallurgical recipe in which each parameter is an ingredient that can be adjusted as needed to best optimize the treatment. Each step is equivalent, for example, to an area of an pusher furnace, but the difference here is that the steps are unlimited. The introduction of methanol gives the carrier gas, formed essentially of carbon monoxide and hydrogen, a gas for which the transfer coefficient of carbon is excellent. To regulate the potential, a liquid fuel rich in carbon with no oxygen content (for example, propane), is needed. The role of the liquid fuel is to maintain the carbon potential at a constant value. In carbonitriding, ammonia is added to the basic atmosphere. Part of the nitrogen from the dissociation of ammonia penetrates into the crystal lattice of the steel by causing an increase in the hardenability. The furnace is equipped with six independent heating areas with a cascade control to respect the homogeneity of ± 8°C requested by the customer over the entire height of the furnace. It is outfitted with several gas injectors and a turbine of the latest generation equipped with a frequency converter. A muffle (bell) of heat-resistant steal constitutes the core of the furnace to obtain a good homogenization of the gases and a perfect exchange between the gases and the parts. With a 12,000-liter oil capacity, the tank is equipped with two beaters that can be activated separately in order to maximally limit weathering on long parts. A cooler keeps the temperature homogeneous, even during quenching. It is also equipped with a nitrogen injector. This allows for moving loads in hot or cold. It is composed of several gas injection systems in order to permit a furnace/tank transfer in a shielded atmosphere to avoid any decarburizing or oxidation. It also has a door to better shield the load. Its movement from one station to another takes place at variable speeds. The converter for the movement system of the transfer bell guarantees precise positioning. It is composed of two tanks laid out in cascade, with a sprinkling system made of booms with rotating nozzles and bath-heating that can go up to 100° C.
An oil catcher, hooked up to the washing machine, separates the oil from the water and recycles the washing water. The tempering furnace, which can reach temperatures of 650°C, is equipped with shielding gas and a blade turbine positioned to obtain a better homogenization of temperatures around 180°C. Once the load has been assembled by the operator, it is placed in this transit station before being transported into the treatment furnace by means of transfer bell No. 1. With its intuitive graphic interface, the AXRON system is simple to use: clear functions, with texts and alarms in the customer’s language, facilitate control. This a system is based on the latest industry standards with 100% Siemens upgradeable equipment. 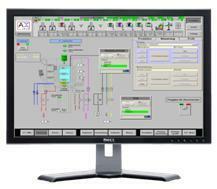 The software is scalable and modular, precise and safe: security process compliant with the ATEX standard. – Regulation of %C (oxygen weld and CO-CO2 analyzer). – Offline simulation and online calculation of the diffusion of carbon in the part, effective depth, surface carbon and weight increase. – Screens defining the calibration parameters of the instruments and measurement sensors (SAT) and the heating chamber (TUS); traceability of all the parameter modifications (date, time and name of the operator). – Management of families, with notion of recipe, cycle, subcycle and steps, structure of treatments and very granular operational elements. Start-stop by weekly schedule, delayed start of treatments. – Management of parts: entry of miscellaneous information on the part (Name, Operation, Weight, Customer, Comments and Load Information); part-family link. – Management of guided records for loads, with numerous research criteria (Date, Family, Part, Order No., Manufacturing Order, item1, item2, configurable for the customer). Generation of paper reports. – Automization of loading, unloading and of the quenching sequence with secured manual control functions and complete automization of installation. 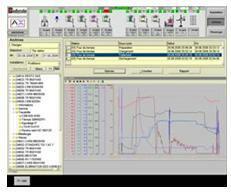 a simplified integration of its production management. Experience shows that with such a system, the start times are cut in half at the beginning, an interface which is much appreciated by the operators. – Safety: no contact with hot parts. – Quality: no oxidation during transfer. – Reliability: automatic transfer of the furnace into the tank. – Minimized output of effluent: quenching takes place in an enclosed space. – Economical: Thanks to the design of the muffle around the load, the consumption of treatment gases is much smaller and thus less costly than those of other batch-type furnaces. – Homogeneity of quenching: the design of the quenching tank that is separate from the heating chamber guarantees a perfect quenching homogeneity over all the treated parts thanks to the quality of thermal exchange in quenching that is unequaled in a batch furnace. – Precision: direct furnace/tank transfer ensures better temperature control during the quenching phase. – Maintenance facilitated by easy accessibility of all mechanical parts. – No weathering of heavily-used parts: no mechanical movement is subjected to a high temperature, which also increases their lifetime. – Independent tank/furnace modules: maximal optimization of their use and thus higher level of occupancy. – Cylindrical muffle for better efficiency: reproducibility and perfect homogeneity (± 5°C). – Treatment gases uniquely in contact with heat-resistant elements: rapid change time and perfect thermo-chemical homogeneity and thus significant energy savings for a batch-type furnace. – Heat-resistant steel muffle allows the rapid conditioning of the atmospheres of the different desired treatments. According to the results obtained, this line of pot furnaces equipped with a gas-shielded transfer compartment offers a solution that will interest customers concerned about treating long parts while guaranteeing a quality of treatments similar to removable-cover furnaces.